The Rio Grande City High School JROTC cadets were recently interviewed for an article that will be highlighted in The Cadet magazine. The Cadet is issued quarterly and is programmed to be released nationwide in February of 2011 to all the JROTC and Senior ROTC programs. This program was selected for its unique feature of the Mounted Cavalry and the tie to Fort Ringgold’s history. “We are proud of the kids, we have something unique here, and it’s nice to be able to share that and show other JROTC programs and cadets the tie to the history,” said Major David Rutledge, JROTC Instructor. According to Rutledge, it was the uniqueness of having a mounted cavalry as well as a regular ground cavalry caught the author’s eye. The RGC High School JROTC is a strong student led program that not only has received Honor Unit with Distinction accolades throughout the years but they have also been featured in various articles and television segments. The cadets participate in various programs, parades, and competitions in and out of the state. 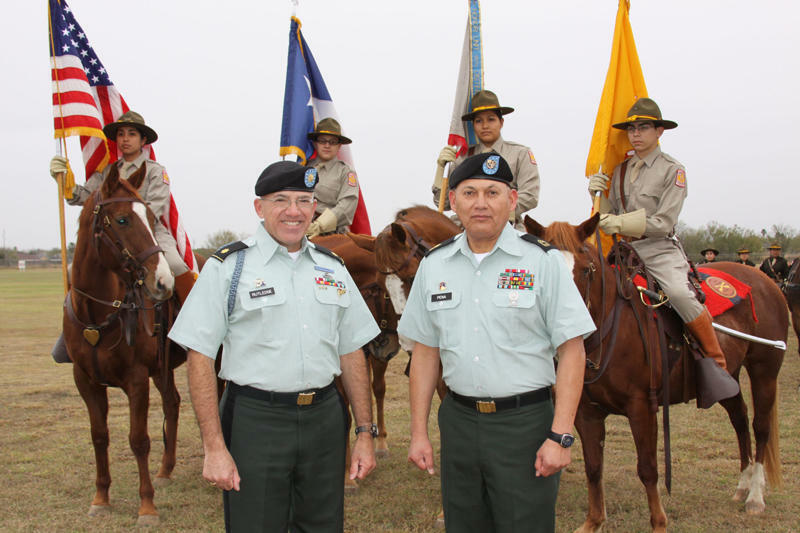 “I feel extremely honored and very special to be part of the JROTC 12th Cavalry because we are bringing history to life,” said Cadet Commander Yvette Zurita. The instructors for this program are Major David Rutledge and Master Sergeant Marco Peña. They have been working together for several years and have succeeded in establishing a solid JROTC program. The United States (U.S.) Army Cadet Command is an organization that commission future officer leadership of the United States Army and motivates young people to be better citizens. Today, Army Reserve Officers Trainings Corps (ROTC) has a total of 272 programs located at colleges and universities throughout the 50 states, the District of Columbia and Puerto Rico. Cadet Command is also responsible for the Junior ROTC (JROTC). Today, there are over 1600 JROTC units and over 274,000 cadets. Congratulations to the Rio Grande City High School JROTC for being selected to be featured in The Cadet. For more information on the JROTC program contact the instructors at (956)488-6000. The Rio Grande City High School JROTC 12th Cavalry will be featured in a national magazine called The Cadet in late February of 2011. John Wayne Liston (The Cadet reporter) conducted the interview where the cadets made sure to highlight their program by giving him an inside look at how the program is run. Pictured left to right are; (Back) Cadet Commander Yvette Zurita, Cadet Major Stacy Muñoz, Cadet Commander Sergeant Major Rosalinda Lara and Cadet Master Sergeant Rosenaldo Garcia. (Front) Major David Rutledge and Master Sergeant Marco Peña (Instructors).